BBC NEWS | UK | Who is Richard Reid? London-born Richard Reid has been sentenced in the United States after admitting trying to blow up a commercial flight using bombs hidden in his shoes. 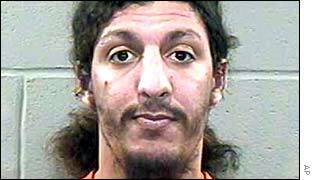 The son of an English mother and Jamaican father, so-called "shoe bomber" Richard Reid was born in 1973 in the London suburb of Bromley. It is hardly a natural breeding ground for dissidents - the borough's schools are among the UK's best, and street crime is half that in smarter areas such as Kensington and Chelsea. The young Reid is said to have attended Thomas Tallis secondary school in Blackheath, south-east London, from 1984 to 1989. His father, Robin, told BBC News he had been in prison for most of Richard's childhood. "I was not there to give him the love and affection he should have got," he said. His son fell into a life of petty crime and in the mid-1990s was jailed for a string of muggings, for which he served sentences in a number of prisons, including Feltham young offenders' institution in west London. It was while at Feltham that Reid is said to have converted to Islam. After his release, he followed the path taken by many other Muslim prisoners, to Brixton Mosque, in south London. The place of worship has a reputation for attracting converts and helping ex-offenders re-adjust to life in the outside world. Initially he fitted in well. Taking the name Abdel Rahim, he became known for his willingness to get involved in the workings of the mosque and to learn Arabic. But at some point Reid began to get involved with extremist elements, says the chairman of Brixton Mosque, Abdul Haqq Baker. Reid was "tempted away" by "individuals who set up a few years ago away from the mosque", Mr Baker says. "Their teachings were a lot more militant." He says extremists worked on "weak characters" and believes Reid was "very, very impressionable". Reid attended external classes and started to question the peaceful philosophy of his teachers. His appearance also changed, says Mr Baker. He went from wearing western clothes to the traditional Islamic thobe - a loose, long-sleeved, ankle-length garment - with a khaki combat jacket on top. Abdul Haqq Baker: "Reid was very impressionable"
There is speculation that at some point during his drift to a more extreme philosophy, he may have met Zacarias Moussaoui, who has been charged in the US with conspiracy over the 11 September attacks. Mr Moussaoui, a Frenchman of Moroccan origin, also attended the Brixton Mosque during the 1990s but was expelled for his extreme views and his attempts to impose them on the younger, more easily influenced members. Towards the end of 1998, Reid ceased worshipping at the mosque and is thought to have moved to Pakistan. He reportedly sent several letters written in Arabic to friends in London. His mother, Lesley Hughes, who is separated from Reid's father, also believed he was in Pakistan. But mother and son eventually lost contact and in summer 2001 Ms Hughes telephoned Brixton Mosque seeking news. About the same time, Reid is believed to have embarked on an extensive travel programme, which saw him visit seven countries including some of the world's so-called "terror capitals". He is thought to have spent time in Egypt, Israel, Turkey, Pakistan, Belgium, the Netherlands, France and possibly Afghanistan. Commentators have suggested he may have used some of these excursions to test the security arrangements on various airlines, before boarding American Airlines flight 63 from Paris to Miami on 22 December 2001. He was overpowered by passengers and crew on the flight after trying to set light to a fuse connected to the explosives. It has also been reported that a computer allegedly used by al-Qaeda leaders in Afghanistan contained files with details of a "scouting" trip Reid is believed to have carried out to identify targets to attack. The computer files describe an operative known as Brother Abdul Ra'uff who travelled to the same countries Reid is believed to have spent time in. Like Reid, the operative travelled on a British passport and was closely questioned by Israeli security. As a result of the files the United States Government laid new charges against Mr Reid, including attempted murder.